This post is sponsored by California Olive Ranch. My grandmother Mimi was known for her homemade shortbread. Unfortunately, I can’t remember ever tasting her shortbread. She was 70 years old when I was born and, naturally, her cooking aspirations declined with age. By the time I was old enough to help in the kitchen, she wasn’t doing much cooking. We made old-fashioned fudge together, I remember that. She always served me bacon and Welch’s grape fruit for breakfast because it was just what I wanted. I pick up on little tidbits about Mimi’s cooking from my dad, like that she fried her grilled cheese sandwiches with some shredded cheese on the outside like I do. And last winter, the scent of my friend’s pot roast almost brought me to my knees—not because I love the smell of beef, but because it took me back in time to Mimi’s kitchen. Mimi was born in 1915, the last of five children. My great grandmother’s family came from Scotland so maybe shortbread runs in the blood. Rumor has it that in high school, Mimi decided to add an “e” to the end of her middle name because she liked the extra flourish it provided. Mildred Kathryne looks nice, I think. She had two sons, seventeen years apart, with my grandfather. The love of her life. When I was little, their exceptional fondness for one another was as real and warm as Mimi’s soft cashmere sweaters. The subject of Mimi’s shortbread tends to come up around the holidays. I have wanted to attempt it for a while now, but I was afraid mine might not match up. After all, I don’t know what her shortbread tasted like. I don’t know if she shaped it into round cookies or petticoat tails. I’m not sure I have her recipe. All I know is that I have her brown eyes, her long piano fingers and her name. Surely that counts for something. Since Mimi isn’t here for me to ask about shortbread, I conceded that I would just have to figure it out the hard way, through intuition and trial and error. I would have to come up with my own favorite version. Then California Olive Ranch, makers of my favorite, go-to olive oil, challenged me to come up with a holiday treat made with olive oil instead of butter. I thought that since I’m making this shortbread my own, I’d try it with olive oil. 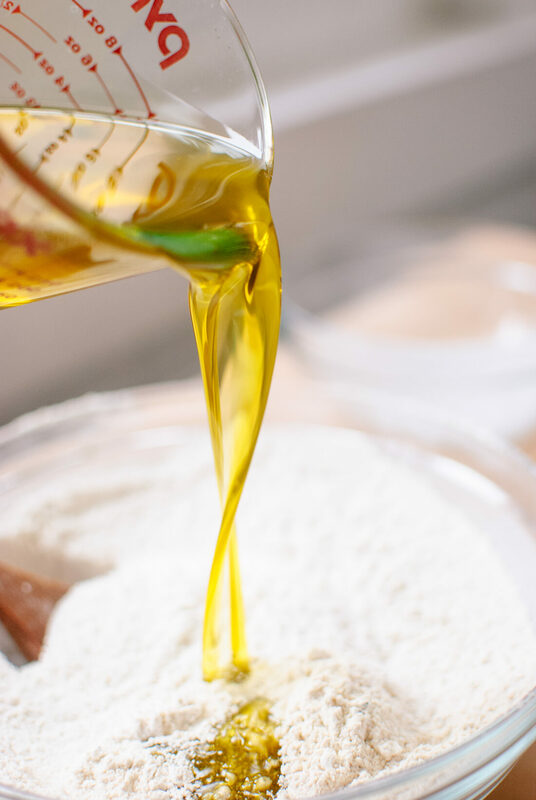 Not because I have any problem at all with Mimi’s buttery shortbread—she lived to 90 and I don’t think butter did her any harm—but because the concept of an herbal, lemony, sweet and savory olive oil shortbread appealed to me. Plus, using olive oil instead of butter would make the recipe dairy free/vegan, so more people could enjoy it at holiday parties. I picked up a bottle of California Olive Ranch’s everyday olive oil for a little over ten dollars at the local health food store and got to work. 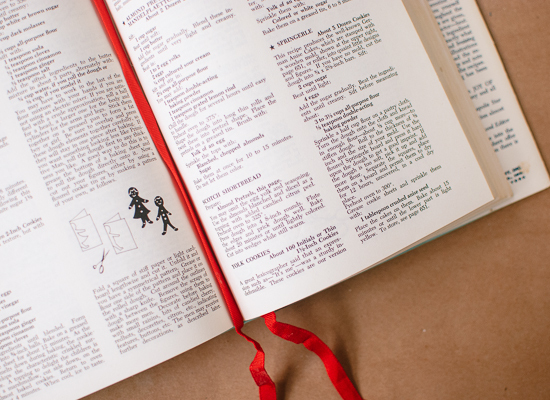 I found a recipe for Scotch shortbread in Mimi’s tattered copy of Joy of Cooking, so that seemed like a good place to start. I went online and read about standard ingredient ratios for shortbread and the history of shortbread (it was first made in Scotland out of oat flour). Oat flour sounded like a good idea to me at first, since I could then share the cookies with my gluten-free friends. My oat flour and olive oil shortbread was a mess of crumbs, though. Four batches of shortbread later, I have finalized my own shortbread recipe. I think Mimi would approve. I ended up using white whole wheat flour, which holds together a little better than the oat flour and is more manageable than whole wheat pastry flour. I added sea salt to enhance the complex flavors found in the olive oil. I also had the best luck with baking the shortbread in a square baker; no matter how long I chilled the dough, it was still difficult to shape into rounds. The method written below yielded the best texture and flavor. Be sure to follow the instructions about cooling the shortbread a little before slicing or it will crumble on you. Light and crisp, sweet and savory shortbread made with olive oil instead of butter. Preheat the oven to 325 degrees Fahrenheit. 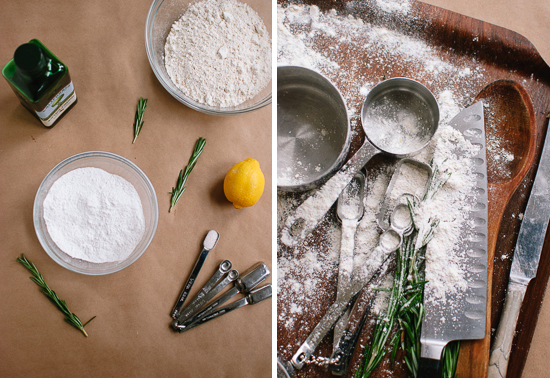 In a medium-sized mixing bowl, whisk together the flour, sugar, salt, rosemary and lemon zest. Pour in the olive oil and stir until all of the dry mixture is incorporated. Transfer the dough to a 9 by 9-inch baker (my porcelain one didn’t require greasing, but you might want to grease your pan first to be safe). Use your fingers to squish the dough into an even layer. Prick the surface of the dough all over with a fork (a diagonal pattern looks nice). Bake until the surface feels firm to the touch and is lightly golden around the edges (keep an eye on it), about 45 to 55 minutes. Remove from oven and let the pan cool for 20 minutes (no sooner and no later!). Then, using a very sharp knife, slice the shortbread into 8 even columns and 4 even rows (cookies will be roughly 1 inch wide by 2 ½ inches long). Try to let the cookies cool some more before using a small spatula to remove them from the pan, or serve them directly from the pan. Recipe adapted, through trial and error, from Joy of Cooking and Wendy Paul Creations. I think a gluten-free flour blend would work well here. 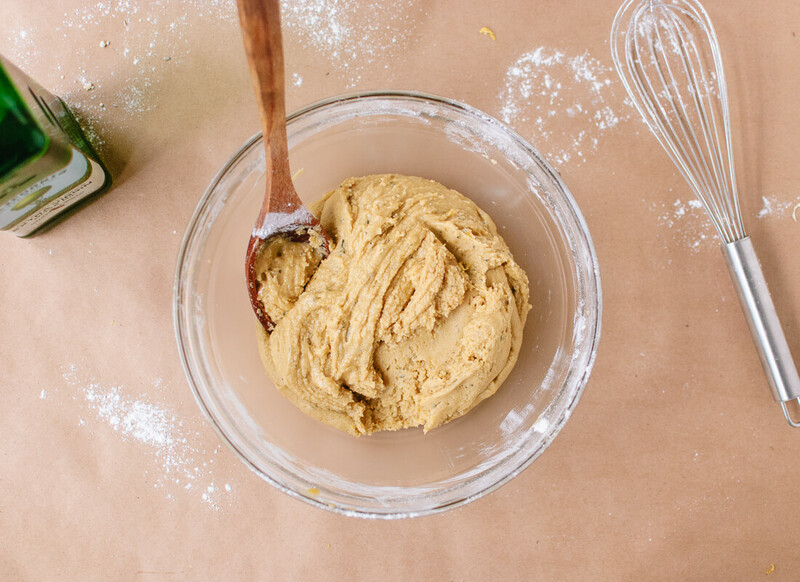 If you want to try using oat flour, you’ll need to use at least 3 ½ cups (or more) since oat flour weighs less by volume than whole wheat flour. *Make your own powdered sugar: pour 1 cup sugar into a blender or food processor and blend until fine and fluffy. I used fine grain organic cane sugar. Recipe updated 12/22: temperature reduced by 25 degrees and baking time extended to reduce browning of the olive oil. Many, many apologies to anyone whose shortbread got too toasty around the edges. 350 degrees works great if you chill the dough before baking, but 325 is best for room temperature dough. This post is sponsored by California Olive Ranch and I received compensation for my participation. Thank you for supporting the sponsors who allow me to serve up more recipes. Opinions are my own, always. I make tons of shortbread but have never used olive oil, thanks for the inspiration! Thanks so much Kate for ALL your recipes! My husband Eric and I look forward to making these shortbreads every year!They are DEElish! Thanks for the great news Kate! I look forward to leisurely turning the pages of what is sure to be a fabulous cook book ,filled with yummy delights! 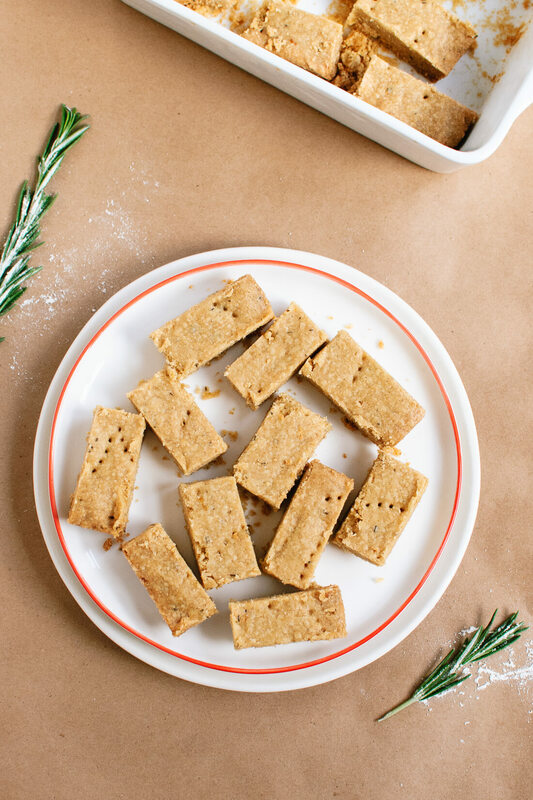 Now to make some rosemary shortbread with a big smile thinking about your upcoming book! Happy Holidays to you and Cookie! Thank you so much, Marg! Yum, I have been looking for a vegan shortbread recipe for sometime now. I cannot wait to try this! Love it! Beautiful sentiment and story. These look absolutely delicious! This shortbread looks incredible! I have been craving a good shortbread for a while and this one is right up my alley. Thank you! Can’t wait to try this recipe, as I’ve substituted King Arthur white whole wheat flour for all purpose, and love when a recipe is already adapted. Plus, California Olive Ranch is my go-to extra virgin. What’s not to love? Must say, every recipe I’ve tried of yours (and that’s been a lot) have been winners. Thanks for offering a marvelous blog! Thank you, Pam! Just delighted to hear that you enjoy my recipes. 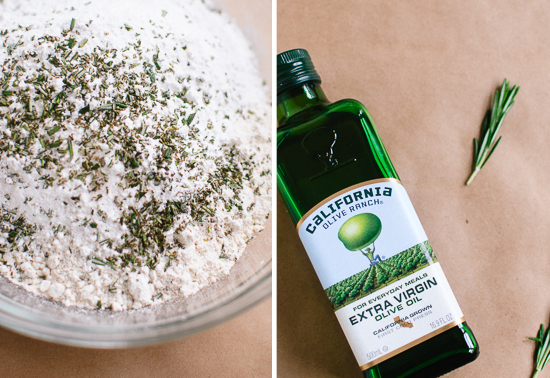 I’m a big fan of King Arthur flour and California Olive Ranch oil, too. Hope you love this shortbread recipe! Aww I love this story Kathryne. My Gran (also from Scotland) was famous for her Scottish shortbread, as well as her Yorkshire puddings. Like you, I was young when my Gran was in her prime cooking years, but I remember her taking me shopping, spoiling me rotten, and playing with my cousins and I in the garden. Her handwritten shortbread recipe currently sits in my mum’s kitchen somewhere, and I don’t actually remember ever tasting a batch that she made – I was only about 5 when she passed away from cancer. Regardless though, I still think of her every time my mum makes it. Now you can pass your own shortbread recipe down to your kids and grandkids! Angela, you always leave the most thoughtful comments. Thank you! I’m so glad we have fond memories of our sweet grandmothers. Maybe I’ll find Mimi’s go-to shortbread recipe someday. I’m glad you have your grandmother’s recipe! Love your memories of your mimi; that’s what all our kids called my mother. And your memories of kitchen time with your mimi reminds me of “helping” my grandma. Shortbread recipe sounds awesome. I’m trying that for our Christmas! Thank you, Syd. I hope your family enjoys the shortbread this Christmas! Gorgeous shortbread, I love that you used olive oil! Pecan shortbread sounds marvelous! Hope your friends enjoy the shortbread! What wonderful flavours. I love rosemary and olive oil in sweet dishes – one of my favourite recipes is for a chocolate, rosemary and olive oil cake. I bet these are delicious and the lemon is such a lovely fresh touch. Skye, that cake sounds so interesting! I’d love to try it. Skye, is it the one from 101 Cookbooks? I have made it before and it is divine!!! Kathryne, I love this beautiful tribute to your Mimi. 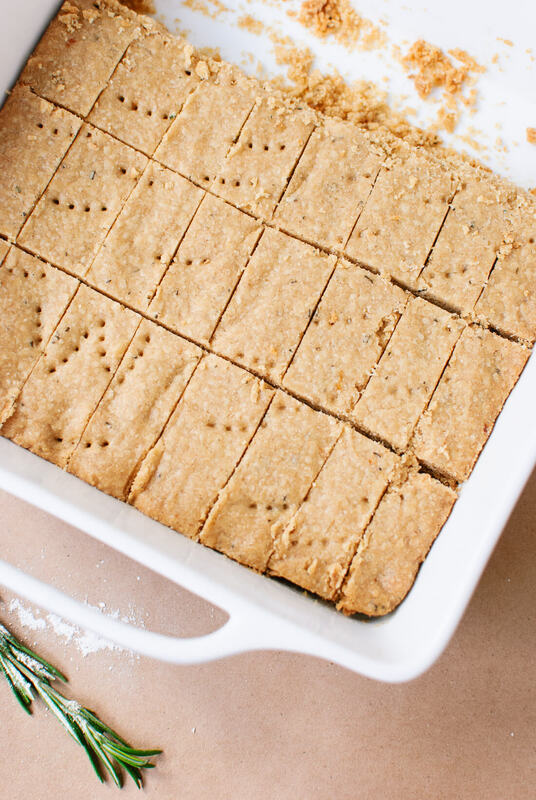 The shortbread recipe sounds delightful… I could totally make this happen now and all I would have to do is walk half a mile to pick up some fresh rosemary and more olive oil. This recipe kinda reminds me of an olive oil and rosemary cake with chocolate chips that I once made from 101 Cookbooks. The combination seemed odd in an interesting way and I knew I had to find out for myself. It did not disappoint and I am positive this would turn out great as well. oooh yum, this is pretty sweet and savory at the same time. Not too bad in terms of fat since it’s olive oil. 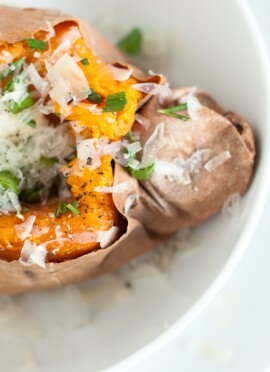 This looks delicious, love that it’s vegan without butter! 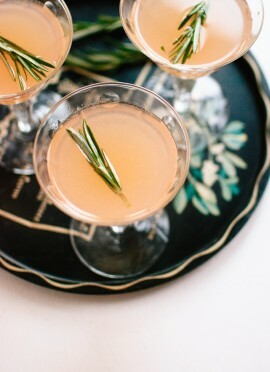 I think this would be good with lavender in place of the rosemary, maybe even coconut oil instead of olive oil, and maybe some honey? I would love to try this recipe! Recreating family recipes is one of the best parts of being able to cook and bake, methinks. The smell alone can bring back so many great memories. I love the herbal infusion to this shortbread!! So lovely. Such lovely flavours and such a beautiful tribute to your grandmother. what a beautiful post about your grandmother Mimi! Thank you for sharing! What beautiful memories and gorgeous looking shortbread! I think your grandmother would surely be happy with this. What a beautiful tribute, Kate – and how fun to try to re-create the recipe, or at least to get as close as you can. Food memories are so special. I think you’re right – she would surely approve of this one! It’s funny how the holidays bring out celebratory moods as well as memories, or thoughts, about those who are not with us any longer. Such a beautiful and simple recipe, Plus, I love how your recipe calls for olive oil, in a shortbread recipe! Totally genius! What a lovely and simple recipe. Pinned! I really MUST start trying to bake! This sounds great! I just made the recipe according to your instructions*, and found the shortbread overbearingly sweet. 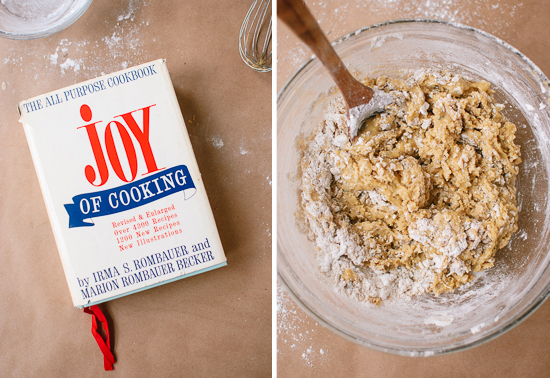 Have you tried making it with less sugar, or replacing some of the sugar with flour? I am unsure of the best method of keeping the texture of the shortbread the same while reducing the sweetness, and hoped you might know a way. Thanks for your help! *Though I added about 1/4 cup of toasted pine nuts and topped the shortbread with flaky sea salt, which I would recommend. Hi! I’m sorry to hear that you found the shortbread too sweet. I don’t love super sweet things but it tasted just right to me. Did you use powdered sugar as directed, or regular sugar? I think you could reduce the amount of sugar by up to one half or so without adding more flour. I saw shortbread recipes with similar amounts of flour and widely varying amounts of sugar. Your pine nut and sea salt idea sounds great, by the way! Thanks for getting back to me! Hope you’ll give them a try with less sugar. I think they will turn out great that way. Hi Bonnie, I’m sorry for the confusion. 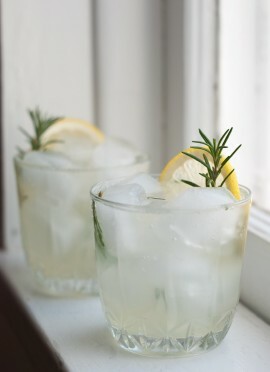 Yes, use the zest of two lemons and save the lemon juice for another recipe, or for lemon water! I love the look of these cookies, and will make them this afternoon. But, I started out on a tablet, and as I scrolled down the page I always got a Geico ad that took over the page and couldn’t be closed. So I would have to reload the page and start over. Finally, I decided that I would just print it instead. Well, 2 or 3 attempts at that didn’t work either, with either the first page, the last page or just the picture printing. Finally had to switch to my laptop to get it. This is a brilliant recipe. A tiny bit sweet but I did use a regular unrefined sugar so next time I’ll follow the instructions and used powdered (icing) sugar!, the salt balance is fab. I can also vouch for the 101 Chocolate Olive Oil cake…. Thanks for all the great ideas. Thanks, Cate! I’m glad you enjoyed it. One cup of regular sugar yields 1.5 cups powdered sugar, so it makes sense that your cookies tasted a little too sweet. If you want to use regular sugar again, you could probably get by with 1 cup. I really wanted to love this recipe – and I followed it exactly – but the cookies are just way too sweet. The salt is excellent, but the sugar kills it! Hey JM, I’m so sorry your cookies turned out too sweet. I know you said that you followed the recipe to a T, but did you by chance use regular granulated sugar instead of powdered sugar? I just made these, after they’d been on my mind for a long time! I used half whole wheat flour and half all-purpose, regular salt, and 1 cup of powdered sugar, and I think the taste and the texture is great! Love the combo of flavors in this. Thanks, Katherine! So glad you loved the shortbread. I still have a few socked away in my freezer, such great treats! Hi, I’m going to try these out to use as canapé bases for my wedding in September. How long do you think these would keep for as I’m trying to find things I can make in advance as I’m doing all the food! Hey Holly! Actually, I have leftover shortbread in my freezer from forever ago, and those cookies are still pretty good! I’d say they keep well for 3 to 4 days at room temperature and much, much longer in the freezer. A simple, quick recipe. This method of using liquid oil is much preferred by myself over the traditional cold butter method. The olive oil really lends itself to the dish, instead of simply providing moisture. Its gentle aroma pairs wonderfully with the almost sweet fragrance of lemon, and the rosemary adds a little depth in the background. Despite the reduction in sugar, the shortbread was pleasantly, gently sweet and not at all bland or tasting too much of the white whole wheat. When baked, the shortbread was delightfully crumbly, but held its shape when cut. I’m quite pleased with the way things turned out, but I did make a couple changes. I didn’t want to adulterate the recipe, but I guess this might be helpful for anyone else who was unsure of how to adjust the recipe to taste. 1) I used about 1/3 cup white sugar (might have been a few tablespoons more, perhaps closer to 1/2 cup) that I blended into a powder. 2) Without fresh rosemary on hand, I used an about equal amount of dried rosemary needles I pulverized with the sugar. 3) the salt was decreased to 1/4 tsp, on account of the much lesser amount of sugar, and my having never needing a full teaspoon of salt for such recipes. Besides those three, no other notable changes were made. For some reason, (perhaps the amount of sugar) the unbaked mixture was quite greasy. I decided to simple dust the top with flour to absorb a little extra grease before popping it into the 325 F oven. It came out alright, although quite brown (oops) throughout, due to having been baked for an hour. I couldn’t decide if the top was “firm” enough to match the pictures on this blog. The top was still a just bit soft, as it dented when I pushed on it for a test. I’ve never baked shortbread before, so I probably baked it for too long, or at too high a temperature for the amount of time I did. I guess I expected it to feel more like a springy, baked cake when testing the top. I’m sorry for leaving such a long comment (I hope I was at least thorough! ), but I really did enjoy this recipe, and wanted to thank you very much for sharing, Ms. Taylor! It’s much more delicious than I’d expected, to tell the truth, as I was unsure about an olive oil shortbread. This is the kind of baked good that evokes dreams of fluffy white clouds, bright blue skies, soft green meadows, and summery picnics on checkered blankets. Hi Louisa, thank you for your thorough feedback! Let’s see, the mixture is on the greasy side, though I’m not sure how mine compared to yours with less sugar. Sprinkling it with flour sounds like it was a good idea. Shortbread doesn’t contain eggs or any other leavener, so it’s never going to be springy. Your version with less sugar might take even less time than mine given the reduction in volume, but I’m not sure. Just pull it out when it’s golden around the edges and firm/not squishy in the middle. It continues to harden up during the cooling process. Can I use regular white flour instead? I’m a huge fan of your blog and recipes, it’s always my go to place especially for baking! I just tried making the shortbread and while the taste is delicious, the texture was too hard to cut through even with my sharpest knife and everything turned to crumbs. I let it sit for at least 20 minutes and greased the pan but it was almost like it needed more moisture. I’d love to figure out what went wrong because they taste so great, any thoughts?! Hey Lindsay! I’m really glad to hear that you enjoy my recipes, but super bummed this one didn’t work out right for you. I have a few ideas—first of all, did you wait much longer than 20 minutes to cut into the shortbread? Twenty minutes is the sweet spot. Too soon and it’s too soft to cut, and too long and it’ll be pretty firm and potentially problematic. Also, did you use the spoon and swoop method with the flour? That’s how I measure my flour and excess flour could have absorbed too much liquid. Sorry again for the trouble. I’ll try to test these cookies again soon just for good measure. Hope they turned out wonderfully, Amy! I was looking for a recipe to use the rosemary my students had grown in the school garden and this was the winner. YUM! Maybe a bit sweet for Aussie tastes but I don’t think the kids will mind and making shortbread with oil is way easier than rubbing all that butter in! Thanks, Fi! Hope this recipe was a hit with the kids! Just made these with local olive oil (Hawke’s Bay, NZ) regular whole wheat flour, and half granulated sugar, half brown sugar. They are divine. Two of us just demolished half of them in 2 mins. I am going to try putting the salt in the food processor next time to avoid it staying in grains. Thank you, Heather! So glad you enjoyed them! I was looking for a recipe using olive oil. I am unable to have dairy or sugar so I substituted 2/3 cup of raw honey. Now I can have a treat at Christmas too! Thank you, Marie! I’m so glad honey worked well for you here. Thanks for the great recipe! I used a cup of sugar and the zest of only one lemon, but the dough tastes so perfect I’m not sure these will make it under the tree for Christmas! I used White Spelt Flour and half Olive oil and half Extra Virgin Olive oil. 1 cup of Powdered sugar. Next time I’ll use less sugar to try a more savoury version! Just made these and they came out perfectly and are absolutely delicious. I was interested to see what the texture would be and if they would have that same shortbread melt in your mouth crumbly feel – and they did! Thank you, Janine! Happy to hear it! I made these exactly as directed (using 1 cup of powdered sugar) except I did not have a 9×9 inch baking pan so used an 8×8. Baked it 50 minutes; waited exactly 20 minute before cutting and had no problems what so ever! I cut the shortbread into little squares since it was thick…delicious! I may have to make another batch to give out for Valentines Day! Hi, Diana–Unfortunately, I don’t have nutritional info available for my recipes just yet. I’m looking for a solution, and will update about it once I find one. Thanks! This is the most delicious cookie recipe I have ever baked. 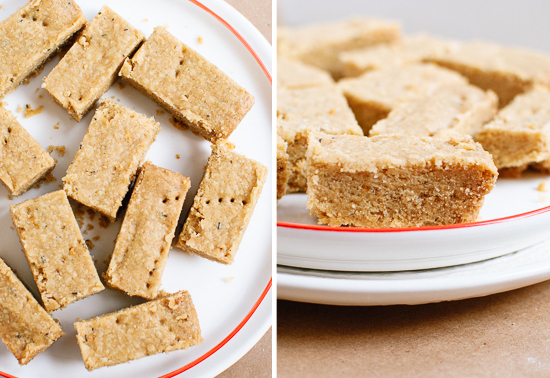 I make these all the time because everyone asks for them and can’t believe they’re vegan and my vegan friends are very excited about being able to eat shortbread. Just about to make a few batches for Christmas presents. Fantastic recipe! Such a fun idea for Christmas presents! I’m happy they have been such a hit for you, Amanda. I appreciate the review. made these at a christmas cookie bake and they turned out delicious! 50 min in a 8×8 pan, but I would have waited to cut them until they were a bit cooler (longer than 20 min) so they didn’t crumble as much. Still super tasty and crazy easy! Yes, fun for this season for sure :) Thank you, Lacey for your review! Lovely site. Please, let me know how much honey should be used instead of sugar. I’m glad this worked gluten free for you, Beth! Thanks for the review. I just happened to have all the ingredients on hand to make these last night and they turned out wonderfully! I did use a bit less than a cup of the powdered sugar and I thought the balance of salty/sweet was perfect. I made them in a 9.5″ round pie dish because I didn’t have anything else and they were fun to pick up and eat like tiny slices of pie. Thanks for posting this! They should keep well for a few days in an airtight container.